by Roskin, Michael G.; Cord, Robert L.; Medeiros, James A.; Jones, Walter S.
Political Science: An Introduction shows readers how the fundamental tenets of political science have helped important leaders make critical decisions for centuries. The authors present a balance of theoretical abstractions and applied reasoning to help readers understand how to make calm, rational choices when it comes to political manipulation. The Fourteenth Edition asks readers to explore the controversial topic of exported democracy, and whether certain countries are ready and equipped to apply our form of government. By examining issues such as the Iraq war and the difficulty of adapting our own democracy in the U.S., the text prompts readers to form their own opinions about democracy and political science. Geared toward those learning about the topic for the first time, the authors encourage readers to consider different paradigms, viewpoints, and theories when developing their own political views. MyPoliSciLab for the Introduction to Political Science course extends learning online to engage readers and improve results. Media resources with assignments bring concepts to life, and offer readers opportunities to practice applying what they’ve learned. Please note: this version of MyPoliSciLab does not include an eText. 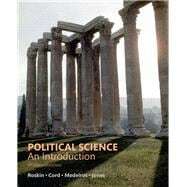 Political Science: An Introduction, Fourteenth Edition is also available via REVEL ™, an interactive learning environment that enables readers to read, practice, and study in one continuous experience.